There is no torture worse than one people learn to live with and even embrace as part of life. From one of the Abyss' infinite layers, such a dark and terrible deity works his way into the hearts of mortals. There are no temples to his name, his priesthood is not prosecuted, and there have been no holy quests against his work. He is the ruler of Zahhak and is known to the rank and file of his cult only as Apathy. The 28th layer of the Abyss stands forgotten among the greater and more active evils that make their name infamous across the Material Plane. Its ruler does not care for recognition as long as he collects his due: the dreams and hopes of everything that lives, crushed under his smothering grip. 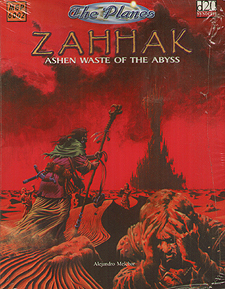 The bitter words of ex-lovers, the exhaustion that remains after anger has left, the bordeom that stains the simplest joys, the disillusionment of goals unattained, and the inertia of a life without direction are the evils that Apathy spreads and that coalesce in Zahhak, with its unending landscape of ashen dunes. Ash is all that is left behind after a fire has burned, and so does Zahhak remain where hope and faith die. The dark lord of the Ashen Waste is not a terrible deity that threatens the world with destruction nor plans campaigns of conquest spanning worlds. He is a thousand times more dangerous because he is allowed to exert his influence unpunished. He is content to let the soulwinds of his realm erode all that is good and pure.